A Colour-Havildar in the 53rd Sikhs (Frontier Force) who was born in the village of Harse Chhina in the district of Amritsar, East Punjab. He was awarded the Indian Distinguished Service Medal for ‘gallantry in the field’ at the Battle of Sannaiyat in Mesopotamia on 7 April 1916. His life has been researched by his grandson, Citizen Historian Squadron Leader Rana Tej Pratap Singh Chhina (retired). Arjan Singh was born around 1879 in Harse Chhina, a village in the district of Amritsar in East Punjab. Enlisting in the Indian army in 1897, Arjan Singh initially saw active service on the North-West Frontier before entering the Great War. During September 1914, Arjan Singh was shipped from India to Egypt at first, then onto Aden and Mesopotamia (modern-day Iraq). It is here, on 6 and 7 April 1916, that Colour-Havildar Arjan Singh, chosen to carry the flag (or colours) of his regiment at parades because of his height and build, served with distinction during the Battle of Sannaiyat. His grandson, Squadron Leader Rana Tej Pratap Singh Chhina (retired), pieced the account of the day through using Arjan Singh’s sheet roll, regimental records and family history. 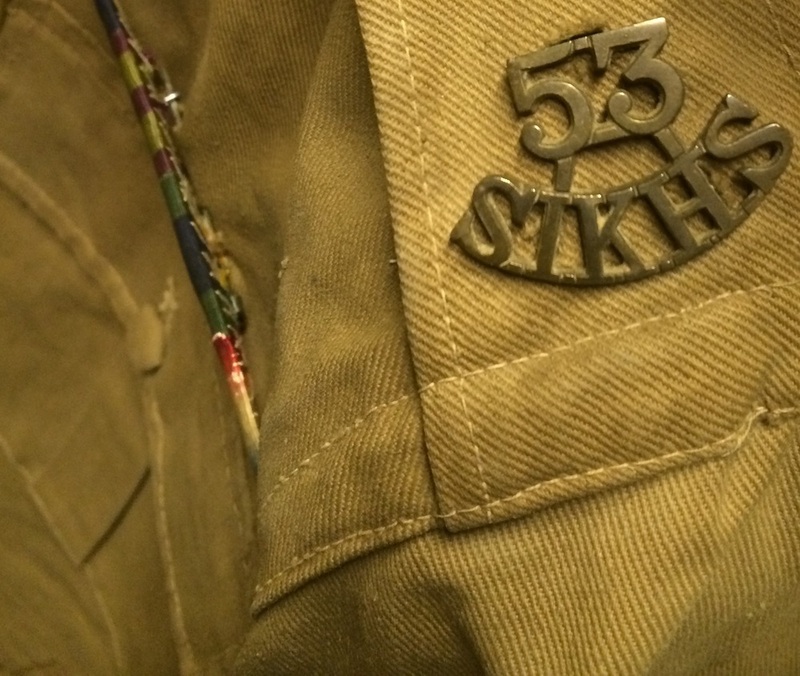 During the night, the waters of the Tigris had overflown the banks but the men of the 53rd Sikhs had a key task to perform in the morning – to breach the Turkish defences. At 9:15am on the morning of 7 April, the 53rd Sikhs, who formed the frontline of the 28th (Frontier Force) Brigade along with the 56th Rifles, deployed from its trenches and advanced forward over dead-level ground. Heavy casualties had forced the reorganisation of the regiment into three companies – A) all Sikhs B) Pathans, Dogras and Punjabi Muslims and C) the 24th Punjabis draft. The regiment advanced in three lines, with the Sikhs and Arjan Singh in the second line. After advancing a thousand yards or so, the regiment came under very heavy rifle fire from Turkish forces. In the face of this, Arjan Singh dropped to the ground, crawled, got up, ran and dropped to the ground while bullets ‘whistled past like banshees’, machine guns opened fire and shrapnel tore into the men around him. The regiment still pushed forward until further heavy casualties forced it to a halt, a mere 800 yards from the enemy position. Arjan Singh saw a British officer felled by bullets and seriously wounded. Seeing him fall, Arjan Singh ran to him, hoisted him on to his back ‘like a sack of flour’ and, holding his rifle in one hand with the officer slung over the other soldier, he carried him to the rear as bullets whistled around. Four British and five Indian officers were wounded while among the other ranks there were seven casualties and 110 wounded. Seven months after the Battle of Sannaiyat, Arjan Singh was awarded the India Distinguished Service Medal (IDSM) for gallantry in action (as evidenced by the Gazette of India Army Department Notification No.1388 of November 17, 1916). He was also mentioned in despatches during the Great War. A story recounted by Arjan Singh to his family talks of how he was saved by his 'Brandy'. 'Brandy' was the name given to the greatcoats that the soldiers were issued. Since it kept them warm — like the liquor — the greatcoat was named after it. Arjan was fighting his way up the Tigris with his battalion to relieve the British soldiers besieged at Kut al-Amara in Mesopotamia. During one march he was knocked out cold. A bullet fired from behind had entered his 'Brandy', which was rolled up and slung across his neck. The Brandy took the bullet. Arjan fell down, the air emptying from his lungs, but survived. He went on to fight other battles. Rana Chhina recalls a story told by an aunt. His maternal grandfather (Nana) was also deployed in Mesopotamia with his regiment during the trench warfare before the siege of Kut al-Amara was lifted. One day, Rana Chhina’s two grandfathers happened to meet in the trenches. It was also the day his maternal grandfather had received a letter informing him he now had a daughter in addition to three sons. As soldiers gathered round to hug him, one sepoy stood up, his head rising above a parapet. A bullet went through it. After his eldest brother, who looked after the family farm, died in mid-1917, Arjan Singh requested to be sent home. He served at an army depot in Jalandhar until 1919 when he was discharged. Arjan Singh died of natural causes in 1939, the year the Second World War began. Arjan Singh was one of three brothers who joined the army, all of whom served within the 53rd Sikhs. His younger brother Bugle-Major Harnam Singh enlisted in the army as a bugler at the age of 13 and by the age of 16, he was a veteran of three frontier campaigns. Harnam Singh was present with Arjan Singh during the Battle at Sannaiyat. For his services during the war, Harnam Singh was awarded a grant of land. Rana Chhina’s exploration of his family history through his grandfather’s participation in the Great War led him to write a book on the Indian Distinguished Service Medal. Rana Chhina is still looking for his grandfather’s citation. He believes it was lost in the tumult of the partition of Punjab in 1947. 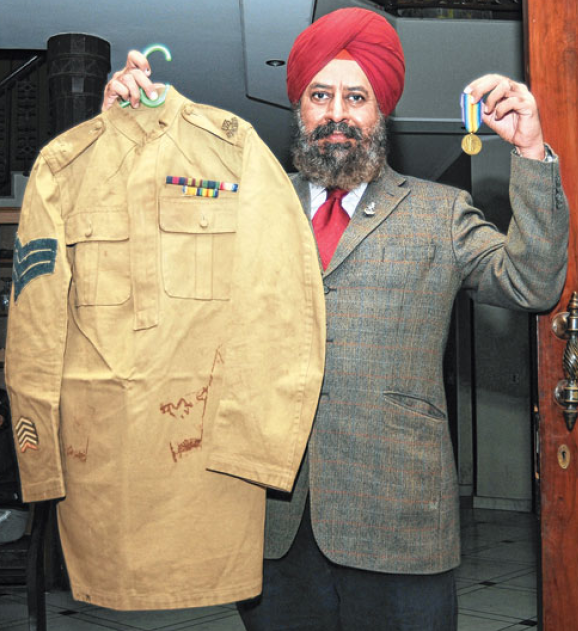 Arjan Singh's uniform is preserved along with his medal ribbon bar by his grandson Rana Chhina. Sadly, his medals were also lost during the partition. In Harse Chhina (also known as Harsha Chhina), World War One is still called ‘Laam ki Ladai’ (The Long War).